The subject of carbofuran is very timely because of recent parallel discussions to withdraw and reinstate the insecticide in different parts of the world. Incidences of intentional and unintentional wildlife poisonings using carbofuran are undeniably on the rise, especially in Africa and India and gatherings of stakeholders are being organized and convened on a global basis. There is still a need to consolidate information on the different experiences and approaches taken by stakeholders. Carbofuran and Wildlife Poisoning is a comprehensive overview of global wildlife mortality, forensic developments and monitoring techniques and is a definitive reference on the subject. 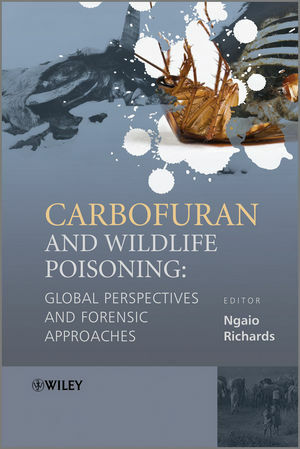 Ngaio Richards is editor of Carbofuran and Wildlife Poisoning: Global Perspectives and Forensic Approaches, published by Wiley. Ngaio ran a session on Wildlife Forensics at the Environmental Forensics Conference in Bournemouth in 2007 which attracted widespread interest. Venkataramanan, R. and Sreekumar, C.